The Edlio team has always known how awesome it is to work for a company like Edlio, but now, everyone else can too! 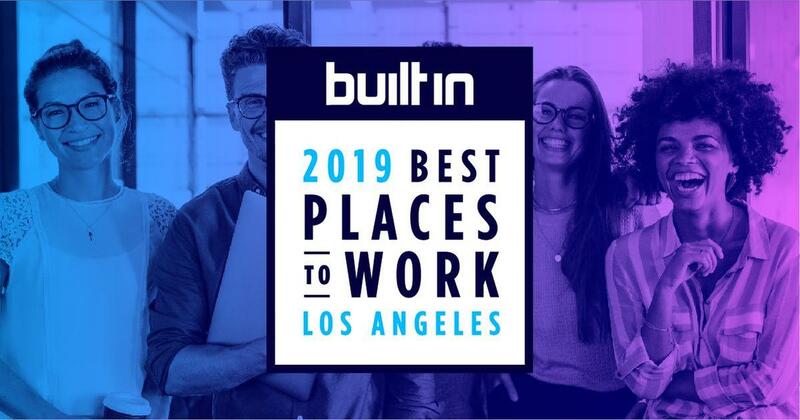 Edlio was recently named one of Built In LA’s Best Places to Work in 2019. Whether it’s our wellness benefits or generous travel incentives, Edlio prides itself on offering excellent work-life balance to its employees. Edlio’s human resource director, Kayla Hediger says, “we place a huge emphasis on work life balance and the importance of health and wellness.” Here’s everything you need to know about what makes Edlio’s culture top-notch! One of Edlio’s most prized incentives is its $2,000 travel stipend. As an Edlio employee, once you’ve been with the company for 1 full year, you are given $2,000 to put towards travel throughout the following year. According to Hediger, “we want our employees to use their time off to explore the world and learn through travel and experiences.” Edlio does ask that you take a picture wearing an Edlio T-shirt during your travel to share the love with the whole company. All that’s left is figuring out where you’ll go next! The team at Edlio knows how important paid parental leave is for new mothers and fathers. That’s why Edlio offers up to eight weeks of paid maternity/paternity/adoption leave to employees who have been with the company for 6 months. The best part? This paid time off doesn’t charge against the employee’s other paid time off! As an added bonus, this eight weeks can be broken up and used anytime up until the child’s first birthday. Given Edlio’s stance on a good work-life balance, all employees receive up to $150 each month to use towards “fitness activities, massage, nutritional counseling, smoking-cessation programs, and weight management programs.” Hediger believes that “inspiring our employees to incorporate healthy habits, such as regular exercise, into their daily lifestyle can help lower overall stress, reduce serious mental illnesses such as anxiety and depression while boosting self- esteem and cognitive function.” Edlio employees love this benefit because it makes healthy living realistic while also making it feel like the company stands behind your goals! Edlio’s newest benefit is meant to help out those who have student loans or will one day be putting a child through college. Welcome, Gradifi. As of December 2018, Edlio now offers three plans through Gradifi that help employees pay off their loans, refinance them, or save for a child’s future college tuition. For all dog lovers and owners, all of Edlio’s offices are dog-friendly! Mushu the Italian Greyhound and Rilo the French Bulldog are always available for a quick snuggle. Ready to start your Edlio journey? Click here to see what job openings might be a perfect match! For more information about this award, click here to read the press release.